"Stocking stuffer" has indeed earned a place on the watch list: In a search of selected newspapers, it showed up almost as often as "'Tis the season" over the past year (672 hits to 754). I think of it as an advertising word (and use "stocking present" myself), but I don't feel much hostility toward it, except when the suggested "stuffer" is a diamond bracelet or a $7,000 watch. But a decade ago, I found myself wondering when the “stocking stuffer” concept had emerged. As a child, I had read about the Bad Old Days when a kid's entire Christmas haul would fit into that lone stocking tied to the bedpost – if the child had proved worthy of treats rather than lumps of coal. When had stocking presents been demoted from the main course to mere appetizers, trinkets to distract the kids while their parents sucked down some caffeine? On no account are you to publish that execrable article on the estimated cost of the gifts in "The Twelve Days of Christmas." Whoever gets assigned to write it every year patently did something very, very bad in a previous life. If you have been guilty of publishing that thing in the past, do not compound your sin. Hear, hear! This is a time-wasting stunt promoted by PNC Bank, which has the chutzpah to label it “financial education.” Nothing in the whole exercise demonstrates anything worth knowing about inflation, the economy, or the price of gifts your true love may be sending you. So the man suggests we stuffer in silence? How much of the white stuff has he been using? How many years before his traditional list of don't makes the don't list? This made me wonder about the word 'stocking' itself. A genealogybank.com search on "stocking stuffer" turns up an early outlier in an advertisement in the Baltimore American of December 7, 1919. The next hit is from 1940, and it becomes common after the war. Yes, it originates in ad speak. So what? It succinctly expresses a useful concept within our cultural context. Are we supposed to express this concept some other way? How? Or is the concept verboten, and this is not actually linguistic advice but an exercise in thought policing? If the suggestion to eschew cliches strikes you as "thought policing," you might want to start looking under the bed every night for grammar Nazis. I hate cliches. I love to hate cliches. I love Christmas. Not the cliches of Christmas, but the cherished traditions -- oh, that expression sounds like a cliche, doesn't it? -- maybe I do love the cliches -- well, not all the cliches, just the ones that are cherished traditions. For me. The rest of you may cherish what you want. No, "'Twas the Night Before Christmas" is not the actual title of that poem. And "Chestnuts Roasting on an Open Fire" is not the right title of that song. For better or worse, it's called "The Christmas Song". I like to know that, but it's OK with me if others don't know it. Trying to purge Christmas of its cliches feels a little grinchlike: like trying to take the fun out of it. But it's fun to rail against cliches. We all have strong feelings about Christmas, I suppose. What's my point? Do I have a point? Have I made my point. Is there an editor in the house? Is "stocking stuffer" used in metaphorical contexts that lead Mr McIntyre to tire of it? Certainly the British equivalent "stocking filler" doesn't seem to me a cliche that needs to be eschewed. I'm with Mr Hershberger on that. It's just a small gift used to fill out the stocking. Straightforward noun phrase. No more a cliche than pie filling or turkey stuffing. In Britain the term stocking filler is used a lot. I think it is more likely to have started with newspapers than advertisers, and I don't think it has any negative 'commercial' connotations. Weirdly though, it doesn't register at all on Ngram British books. Strange! "When had stocking presents been demoted from the main course to mere appetizers, trinkets to distract the kids while their parents sucked down some caffeine?" Leaving the when aside for a moment, I think the why is clear enough. Parents want to maintain the Santa Claus tradition but also want to openly give Christmas presents to their kids. The solution embraced by tradition is to say that presents in the stocking are from Santa whereas presents under the tree are from us. 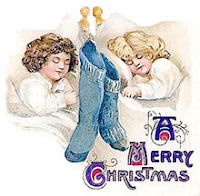 If that's the case, then it seems reasonable that stockings would have been sidelined about the same time it became traditional for everyone to give presents to each other, children to children, children to parents, parents to parents, and not just parents to children. After all, even very young children understand themselves not to be Santa. Outerhoard, I wasn't raised with that distinction between stocking presents and under-the-tree presents. When we were very small, everything came from Santa; when I was old enough to take a younger sibling to the dime store and buy Mom some Evening in Paris or green stationery, we must have been exchanging individual presents too. But this was a big family, enjoying the novelty of the aforementioned postwar prosperity, and perhaps more child-centered than yours. Richard: Thanks for the early cite! In a way, it reinforces my theory that "stocking stuffer" is a term that goes with abundance; the coinage was out there, but it didn't catch on till stocking presents became little extras rather than the main gift event. I was raised with that distinction. Under the tree was from family, in the sock was from Father Christmas, and Father Christmas had a disappointing habit of using various fruit and nuts as stocking fillers. Always a tangerine in the toe, for instance. Perhaps he was paying us back for those mince pies he had to eat, year after year, in the saucer in the fireplace. Doonesbury does it -- do you?